Home NEWS Pastors, Church Elders arraigned in court for assault, creating disturbance in church. Pastors, Church Elders arraigned in court for assault, creating disturbance in church. Nine people, among them pastors and church elders, were on Monday arraigned in a Kandara Court on charges of creating disturbance in a manner likely to cause a breach of peace contrary to Section 95 (I) (b) of the penal code. 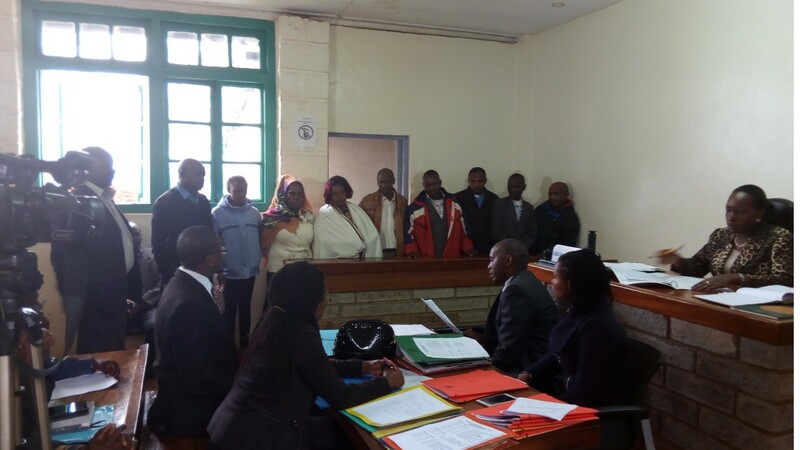 Simon Waweru Wagucu, Isaac Maina Toro, Francis Ndegwa Ngugi, David Kibaka Ng’ang’a, Joseph Waweru Mwangi, Anne Wambui Murigi, Sabina Mugure Maina and Caren Wambui Maina were charged that on the 3rd of September 4, 2017 at around 9am at Gakarara AIPCA Church in Kandara Sub-County, Murang’a, jointly with others not before court created disturbance likely to cause a breach of peace by locking Gakarara AIPCA Church using chains and padlocks and welding the doors of the church for other congregation not to access to the church. They were faced with additional charges of attacking and injuring a police officer CI Thomas Parkolwa and resisting arrest. A ninth suspect, Edith Wairimu was charged on a separate offence of abusing one Linus Michuki by calling him stupid and ‘takataka’. Representing the suspect, Counsel Mbiyu Kamau pleaded with the court to grant him some more time to peruse the charges, asking the court to provide him with the charge sheet, copies of the police statement, and any other documentary evidence against his clients. He also appealed to the court to grant his clients with a lenient bond, preferably personal bails as they all hailed from humble family backgrounds. With the prosecutor having no objections to the lawyer’s request, Hon. Manuela Wanjiru Kinyanjui released all the accused on a KES. 10,000 bond each. The case will be mentioned on the 15th of November and hearing fixed on 18th November 2017.